This is her official website. Welcome. La Pulcina travels to the ends of the earth and beyond to plant her flag in the name of love. The Clothespin Repertory Theatre celebrates the extraordinary life and loves of La Pulcina Piccola. La Pulcina Piccola's fans are legion. Her devoted admiration society -- the Pulcinisti -- celebrate every event, devour every morsel ofknowledge, and support Pulcina scholarship. Your exclusive source for La Pulcina Piccola's signature line. 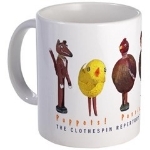 Visit Pulcina: The Store for housewear -- mugs, magnets and mousepads -- and discover Pulcinawear apparel: Tshirts, hoodies, and aprons for adults. You'll also find bibs, onesies and Ts the small ones. With SMALL FISH in the works, can the album be far behind? We are pleased to reissue this extraordinary chronicle written by our beloved La Pulcina Piccola herself. Look for additional installments every Wednesday through the end of May. You are about to read the extraordinary "Secret Diaries of La Pulcina Piccola" (Chicken Little), the fabled chicken who came to world recognition as a result of the fabled sky-is-falling incident. It is principally that event for which she is known. Scholars have long been aware, however, that there is more to her story than is usually told. Now, in this chronicle, she is revealed in her own words as she travels the world from her home barnyard to the Big City and beyond. While her career spanned many disciplines, everything she did is marked by her courage, her fortitude, and the fact that she never lost sight of affairs of the heart. She was indeed an extraordinary chicken.